It still stands among the greatest single seasons in the history of professional golf. Hogan, 40, was unable to enter — and possibly win — the 1953 PGA Championship (to complete the Grand Slam) because its play (July 1–7) overlapped the play of the British Open at Carnoustie (July 6–10), which he won. It was the only time that a golfer had won three major professional championships in a year until Tiger Woods won the final three majors in 2000 (and the first in 2001). Hogan often declined to play in the PGA Championship, skipping it more and more often as his career wore on. There were two reasons for this. First, the PGA Championship was, until 1958, a match play event, and Hogan's particular skill was "shooting a number" — meticulously planning and executing a strategy to achieve a score for a round on a particular course (even to the point of leaving out the 7-iron in the U.S. Open at Merion, saying "there are no 7-iron shots at Merion"). Second, the PGA required several days of 36 holes per day competition, and after his 1949 auto accident, Hogan struggled to manage more than 18 holes a day. Hogan remains the only golfer in history to win the Masters, U.S. Open, and British Open in the same calendar year (1953). His 14-under par at the 1953 Masters set a record that stood for 12 years, and he remains one of just nine golfers (Jack Nicklaus, Raymond Floyd, Ben Crenshaw, Tiger Woods, David Duval, Phil Mickelson, Charl Schwartzel and Jordan Spieth) to have recorded such a low score in the tournament. In 1967, at age 54, Hogan shot a record 30 on the back nine at the Masters; the record stood until 1992. Many supporters of Hogan and some golf historians feel that his victory at the Hale America Open in 1942 should be counted as his fifth U.S. Open and 10th major championship, since the tournament was to be a substitute for the Open after its cancellation by the USGA. The Hale America Open was held in the same time slot and was run like the U.S. Open with more than 1,500 entries, local qualifying at 69 sites and sectional qualifying at most major cities. The top players, who were not off fighting in World War II, participated and the largest purse of the year was awarded. 1 Defeated Mangrum and Fazio in 18-hole playoff: Hogan 69 (-1), Mangrum 73 (+3), Fazio 75 (+5). ↑ Golf Legends - Ben Hogan Archived May 16, 2006, at the Wayback Machine. ↑ "The Hard Life of a Golfing Great". Bloomberg Businessweek. June 18, 2004. Archived from the original on March 8, 2012. Retrieved October 17, 2013. ↑ "Ben Hogan's Triple Crown". The Augusta Chronicle. February 15, 2013. Retrieved April 27, 2015. ↑ Elliott, Len; Kelly, Barbara (1976). Who's Who in Golf. New Rochelle, New York: Arlington House. pp. 93–4. ISBN 0-87000-225-2. ↑ Jacobs, John (2000). Fifty Greatest Golf Lessons of the Century. William Morrow. ISBN 978-0062716149. ↑ Middlecoff, Cary (1974). Michael, Tom, ed. The Golf Swing. Prentice-Hall. p. 32. ASIN B000N6ZBEQ. ↑ Politi, Steve. "Ben Hogan made U.S. Open history with the 1 iron, but the club has vanished from golf". New Jersey On-Line LLC. Retrieved October 29, 2015. ↑ Wanke, Michele. "Sports Illustrated Photo Pioneers". LoveToKnow. Retrieved October 29, 2015. 1 2 3 4 5 6 7 8 9 10 11 12 13 14 15 16 17 18 19 20 21 22 Hogan, Ben (1957). 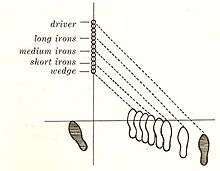 Ben Hogan's Five Lessons. Fireside. ISBN 0-671-61297-2. ↑ Hogan, Ben (March 11, 1957). "The modern fundamentals of golf: the grip". Sports Illustrated. ↑ "1953 Ben Hogan". The Open. Retrieved October 17, 2013. ↑ Wagner, James (March 13, 2009). "Are the yips more than something in the head?". Los Angeles Times. Archived from the original on March 17, 2009. ↑ Kelly, Brent. "PGA Tour Scoring Record – Most Strokes Under Par Over 72 Holes". About.com. Retrieved January 27, 2013. ↑ McAfee, James (June 6, 2011). "Did Ben Hogan Win Five U.S. Opens?". Exegolf magazine. Retrieved September 16, 2011. ↑ Hanley, Reid (June 16, 1992). "Hale America: A U.S. Open?". Chicago Tribune. Retrieved September 16, 2011. ↑ Alvarez, Rob (June 23, 2011). "Museum Moment: The Hale America National Open Golf Tournament". USGA Museum. Retrieved September 16, 2011. ↑ Yocom, Guy (July 2000). "50 Greatest Golfers of All Time: And What They Taught Us". Golf Digest. Retrieved December 5, 2007. ↑ Golf Magazine, September 2009. ↑ Wall, Jonathan (May 20, 2014). "Return of a legendary brand". PGA Tour. ↑ Rovell, Darren (August 12, 2003). "Legendary brand will soon have new owner - again". ESPN. Retrieved May 26, 2010.